Which treadmill or running sensors is compatible with Arcade Fitness? Many of you propably remember what is foot pod: a small, light device that you can attach on your shoelaces. It was here before smart watches, and it is very useful for training (and even for a race!). Foot pod measures not only distance and speed, but also running cadence. If you run indoor, GPS tracking will not be available and using a foot pod will be the best solution to follow your activity. Like ANT+ footpods, any bluetooth footpod are now compatible with Arcade Fitness. Milestone footpods are for example compatible : this is the footpod we choose to test with Arcade Fitness! Just one important thing : be sure to have the latest beta firmware which allows realtime speed broadcasting. There are also other options if you have iPhone and want to use it as a footpod : download "Treadmill Smart Speed" on the Apple Store. Xiaomi Smartbands are compatible with Arcade Fitness. Use your band in order to transmit running speed on a treadmill to your phone and enjoy playing video game. 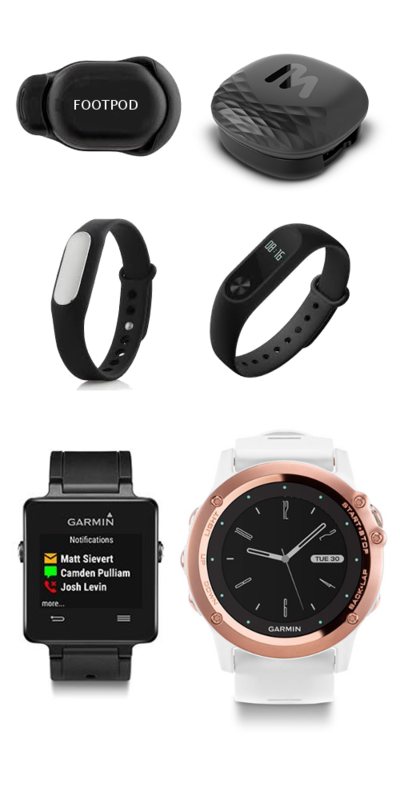 Use your Garmin watch as a gamepad to play Arcade Fitness on your Android phone or tablet and enjoy video game while running on a treadmill. Use your Samsung watch to broadcast heart rate and running speed with Bluetooth and play Arcade Fitness while running on a treadmill. The Moonrun system : a portative and lightweight device, based on elastics fixated on the wall or on a door. 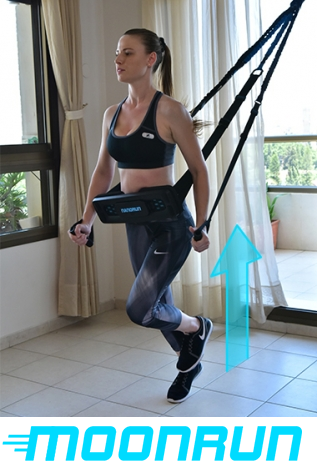 A lap belt holds the runner to the ground, which procures a great running sensation. It has the advantage of offering a complete interaction with Arcade Fitness : if you jump, your avatar jump too in the game, if you rotate your pelvis, your avatar makes a U-turn. Among other advantages: the weight of the body is not on the vertical which is good for the knees and it is much less dangerous than a treadmill.